Spiderwort is a native perennial species with a large, fleshy stem and long, grass-like leaves. Flowers have three petals that are normally purple to pink in color. 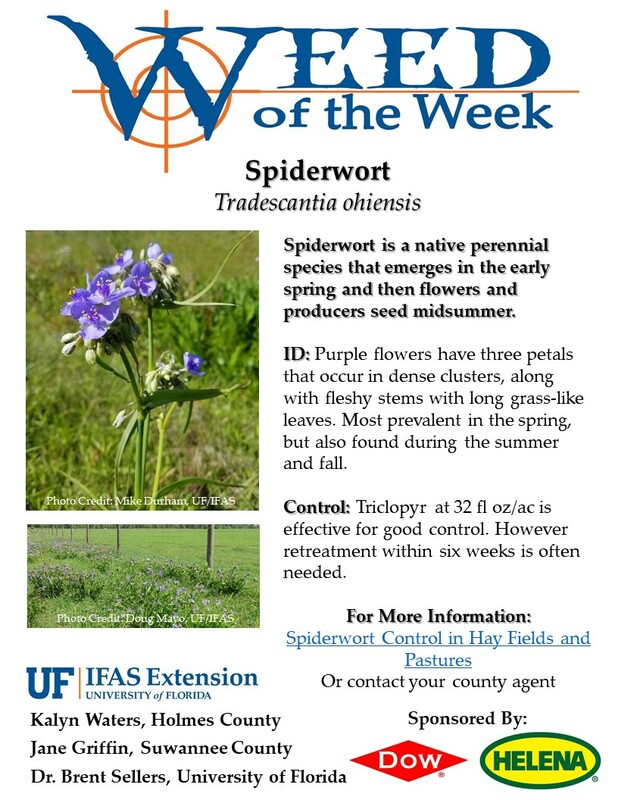 Spiderwort emerges in early spring and produces seed throughout the summer. This plant is not palatable to cattle, leading to patchy grazing in pastures. Additionally, the large fleshy stems impede hay production as they do not dry as quickly as the grasses. Spiderwort management is pastures is best controlled by Triclopyr, and re-treatment 6 weeks following the initial treatment may be needed. Jane is the Agriculture and Small Farms Agent serving Duval County. She enjoys riding her horses, working cows, and taking her dogs on adventures.